French electronic duo, Daft Punk has been missing in action since their 2007 album, Alive, except for maybe some surprise appearances (such as this one). 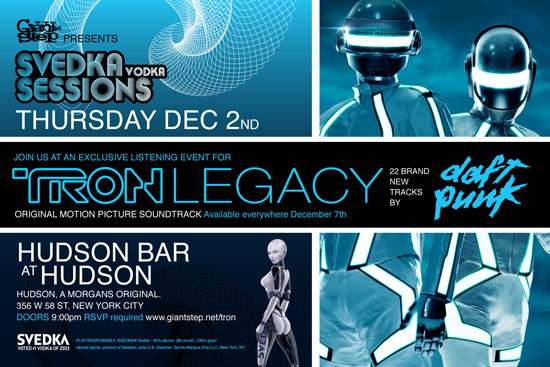 That is until the release of their new album: Tron Legacy (Soundtrack), scheduled to launch next week, December 7. But if you really can't wait to have a sample, how about a listening event this Thursday at the Hudson Bar in New York City? Giant Step and Svedka Vodka are collaborating to throw le fete de Daft Punk--just for the French electro enthusiasts who'll get a taste of the 22 brand new tracks--revealed pre-public launch.